This challenge is over! You can discover the winners. Are you a university or engineering school student studying industrial maintenance, information technology, electronics, design, fashion, or business? Then team up with two world leaders in the fields of Process and Energy. 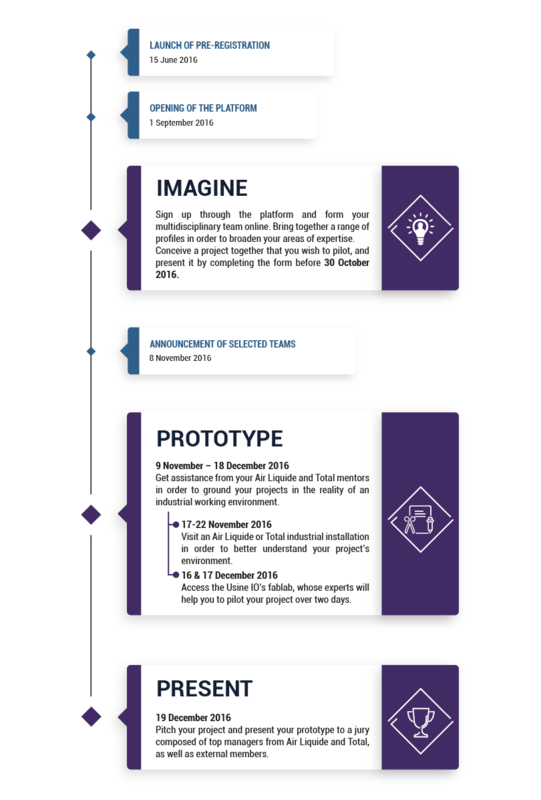 The two Groups have joined forces to organise an innovation contest that allows you to imagine the operator of the future, and to pilot your ideas. Expose your ideas to one of the main challenges inindustrial transformation, and showcase your potential for innovation. As a team, imagine the operator of the future, take advantage of mentors, meet professionals and pilot your project at Usine IO's fablab in Paris. Digital technologies and/or services should provide greater security to Operators and/or their surroundings. Digital technologies and/or services should provide the Operator with first-hand knowledge in order to simplify maintenance or inspection operations as well as communication with the control room, support, etc. Digital technologies and/or services should simplify the organization of the Operator's daily tasks, planned or unplanned, as well as interactions with internal or external teams. Digital technologies and/or services should simplify the Operator's interactions with their industrial environment. The winning team will be flown to the Las Vegas Consumer Electronics Show, running from 5-8 January 2017. Each team member will return with an Apple MacBook Air. Each team member will win an Apple Watch. Why participate in the Boost My Op' challenge? This challenge gives you the dream opportunity to develop a project, in partnership with Air Liquide and Total, that will change operators' ways of working. Register and form your team of 1 to 4 members. You will have the chance to visit an Air Liquide and Total factory in order to understand all of the issues related to your subject, and add substance to your project. You will also be able to pilot your idea by earning an invitation to the Usine IO's workshop in Paris, thereby benefiting from this organisation's expertise and know-how. But this is also a fabulous opportunity to interact with experts from the two companies, introducing yourself and making new contacts. Air Liquide and Total want to take your ideas as far as possible by putting your innovations into practice. This may take the form of field tests, Proofs of Concept or subsequent development work carried out with you after the challenge. This is the chance for you to see your own project implemented by two major groups. So take advantage of this challenge to get off the beaten track and demonstrate your full potential for innovation in order to define the operator of the future. World leader in gases, technologies and services for Industry and Health, Air Liquide is present in 80 countries with approximately 68,000 employees and serves more than 3 million customers and patients. Oxygen, nitrogen and hydrogen have been at the core of the company’s activities since its creation in 1902. Air Liquide’s ambition is to be the leader in its industry, delivering long-term performance and acting responsibly. i-Lab is Air Liquide laboratory for new ideas, to help accelerate the pace of innovation and explore new markets. This laboratory is both a Think Tank and a venue for experimentation in new ideas that will benefit the Group. The Connect project lead by Air Liquide France and the i-lab was certified “technological showcase” by the Industry of the Future Alliance (Alliance Industrie du Futur), an association gathering french Industry and Digital Technology professional organizations. The world's fourth-largest oil and gas company*, with a presence in over 130 companies. Since its founding in 1924, the Total Group has made its mark over the years as a major player in the oil and gas industry, as well as in the chemicals sector. Organised into three complementary divisions that range from exploration to distribution (Upstream, Market & Services and Chemical Refining), Total is present across the full spectrum of the oil and gas chain of production and supply. In order to broaden its offering, the Group is also developing alternative sources of energy alongside hydrocarbons: at present, solar energy, with biomass to come in the near future. Total has adapted its offering to environmental and energy-related challenges through adopting a continually more ambitious strategy of innovation. Committed to better sources of energy, the Total Group's 100,000 employees make a contribution throughout the world in providing customers with the safest, cleanest, most efficient and most innovative products and services, accessible to as many of them as possible. * Based on the criterion of stock market capitalisation (in dollars) as at 31/12/2015.